after the standards that identified the different districts and around which the inhabitants of the area gathered. In 1343 the Gonfaloni were reorganized since the city had grown considerably within the new circle of Arnolfo di Cambio's walls. The original six districts were replaced by a new subdivision into quartersnamed after the city's most important churches: San Giovanni, Santa Maria Novella, Santa Croce and Santo Spirito. The number of Gonfaloni was set at 16 and their functions gradually took on an administrative nature. The quarter of Santo Spirito was subdivided into 4 gonfalons: Drago, Ferza, Nicchio and Scala. Each gonfalon differed as to size, population and social fabric, but they were all characterized by spacious green areas within the 2 walls and by the prevalence of wool guild workers and craftsmen, especially in the Gonfalone of San Frediano Drago) and that of Santo Spirito (Ferza). Nowadays the Oltrarno is a living reality where the past is still alive in the "hum" of generations of craftsmen tenaciously attached to their ancient crafts. In the labyrinth of lanes in the Oltrarno one can still encounter artisans who preserve and hand down original and refined working methods, directly transmitted by the craftsmen who in past centuries enriched Florence with their handmade objects. The survival of these techniques is entrusted to the patience and diligence with which they ply their craft every day, producing unique pieces appreciated by those who know a fine craft object when they see it. For Antonio Paolucci the "true genius of the Italians" lies in their artisan talents, the fruit of "a conscious trans-mission of beauty, an ancient wisdom which flowers in the fantasy or in the intellect". The Gonfalone of the Drago covers the entire area of the stretch of the Arno between the Ponte Santa Trinita and the Torrino di Santa Rosa, the ancient walls that joined it with San Frediano and Porta Romana (in great part still there along Viale Ariosto and Viale Petrarca), Via dei Serragli up to Via della Chiesa, Via delle Caldaie, Via del Presto di San Martino and Piazza Frescobaldi. It was one of the largest of the Gonfaloni, with a population that came mostly from the surrounding countryside, clustered around the numerous religious settlements. 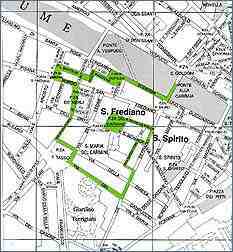 The best way to wander though this area and discover the charm of San Frediano and its most characteristic nooks and corners is to think of the long Via dei Serragli as the borderline with the neighboring Gonfalone. The itinerary begins at the Ponte alla Carraia, dating to the early thirteenth century, destroyed in 1944 and rebuilt in the 1950s. From Piazza Nazario Sauro, where the Soderini owned numerous houses, walk along the Lungarno Soderini, once lined by the gardens of this illustrious family. Skirt the wall of the Seminario Maggiore, till you get to Piazza del Cestello, with a magnificent view of the church of Ognissanti across the way and the patrician palazzi on the right bank of the Arno. The western side of the piazza is closed by Cosimo III's massive "Granaio" or Grain warehouse, built in 1695.
and artisan workshops. There is also a workshop in this street specialized in repairing the fortepiano, the ancestor of the piano, and a concert hall. Until the 1970s Via dell'Orto and Via di Camaldoli were famous for the preparation of tripe which was boiled in great cauldrons over wood fires. The water or "broth" in which they were cooked was sold in flasks by errand boys and enjoyed hot in the workshops throughout the neighborhood. The next stop is Piazza Torquato Tasso, opened towards Bellosguardo in 1912 and then enlarged in the 1930s, pushing it back as far as Via della Chiesa. Inside and along the walls of Viale Petrarca was where the hackney drivers kept their coaches and horses, while in a corner between Via del Leone and Via della Chiesa is the copy of a fine tabernacle attributed to Giottino. At the beginning of the street, in the Albergo popolare built at the back of the Carmine, one can see one of the finest frescoes by Master Luciano Guarnieri depicting the Arno and its valley. Continue along Via del Campuccio up to Via dei Serragli, with 19th-century low-cost housing on the left and the wall of the Torrigiani gardens on the right. They are one of the largest private gardens in Florence (almost seven hectares) "a piece of nature set into the city". At the corner with Via dei Serragli, the oratory of the old monastery of Sant'Elisabetta delle Convertite, transformed into the Istituto degli Artigianelli, has been reopened. Continuing along Via dei Serragli, you pass Via della Chiesa, where the corner shrine contains a fresco of the "Madonna and Child with Saints" by Cosimo Ulivelli (1668), and eventually reach the narrow quiet Via dell'Ardiglione which leads to Via Santa Monaca. At the arch known as del Papi, a plaque commemorates the house where the great painter Fra' Filippo Lippi was born. In Via Santa Monaca, in the premises of the former Augustinian monastery frescoedby Cosimo Ulivelli, Camilla Martelli, second wife of Cosimo I, died. At the "Canto alla Cuculia" on the corner with Via dei Serragli you can stop and admire the charming shrine with the fresco of the "Madonna and Child with Saints" by Lorenzo di Bicci. To be noted in the stretch of Via dei Serragli which moves down towards the Arno are the fine Mazzai, Pallavicini and Rosselli del Turco palazzi. There are nume-rous stores and historical shops of second-hand dealers and bronze workers along this stretch. From the corner between Borgo Stella and Borgo San Frediano the most striking building is the spacious Palazzo Del Pugliese, which later passed to the marquis Feroni, with its spacious courtyard and garden. Borgo Stella leads into Piazza del Carmine, and the itinerary comes to an end in the temple of Italian painting: the ancient church of Santa Maria del Carmine with the famous frescoes by Masaccio, Masolino and Filippino Lippi in the Renaissance Brancacci Chapel. The Baroque Corsini Chapel with the masterpieces by Foggini and Luca Giordano, the church, rebuilt after 1771, the sacristy and the entire convent deserve a leisurely visit.